Throughout my career I have focused exclusively on creating software. Software is an interesting trade in which your raw materials, bits, are nearly limitless and recyclable compared to carpentry’s used of wood. The barrier to entry for tools that software developers can use to turn their virtual creations into real physical objects is plummeting dramatically. 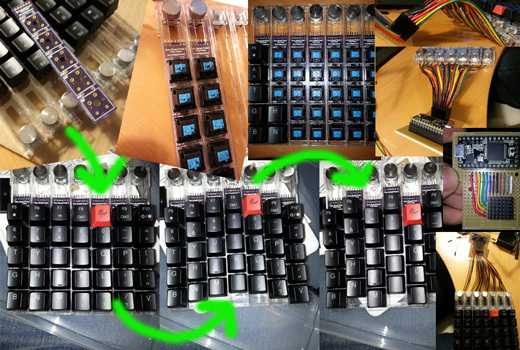 Virtual Reality eye ware, 3D printing, Laser cutting, modular microcontrollers are all becoming simple to use, so simple in fact, that I was able to develop my first physical project: A portable gaming keyboard. 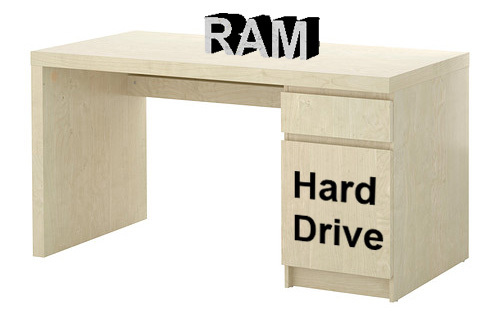 Back when I was working in the tech shop in CompUSA I came up with a good analogy for explaining the differences between RAM and Hard Drives to people who didn’t understand what they were looking at in computer specs. Imagine you have a desk with a drawer. Now you have various things in the drawer of the desk, say taking notes in a notebook, a todo list, an appointment book, a sketchbook. To be able to work on any one of those items you need to take them out of the drawer and place them on the desk, not overlapping anything and not hanging off the edge. If you have a really small desktop surface, you might be only able to fit your notebook and todo list on it at one time. If you wanted to sketch on your sketch book, you first have to put your notebook back into the drawer then take the sketch book out and put it on the surface. The surface of the desk represents RAM and the drawers represent hard drives. If you want to be able to work one more things at once quicker, having a larger desk surface would let you have more items on it so you can switch between tasks quicker. Lets also say, your are running out of space in your drawer, you can get a 2nd drawer to add to the desk to fit more things in. Probably not useful to anyone who is reading this, but maybe it can making explaining tech specs to some one less technical a bit easier. My degree never broke into Big O notation or anything fun, it ended up being much more high level and less mathy (which bothered me). Overall I think the interview was positive, though I was definitely caught off guard by their programming questions. I feel that me getting a the job could be 50/50, lets just hope that its just me thinking about it too much.